Your alarm goes off and even though you know you shouldn’t, you immediately grab your phone to check what came in overnight. Luckily you did because you had a potential client book a discovery call for later today. Score! You’re on a total roll. Every day this week you’ve woken up to a new discovery call booking. Things have really started to pick up for you. Energy is flowing in the right direction for sure. Cha-ching! Do you have a steady flow of client leads coming in like this? The outer world reflects your inner world, and it takes 1-2 months to catch up once there has been a shift. It’s the middle of January. How are you doing on communicating to your audience? Be honest. What’s working well and what’s not? How can you shift to fix what’s not working? If you’re getting stuck on anything with your communication plan, hit reply so we can talk about it via email. Two weeks ago, I did a live on Your Communication Plan. Check out the recording here, and get the free guide. 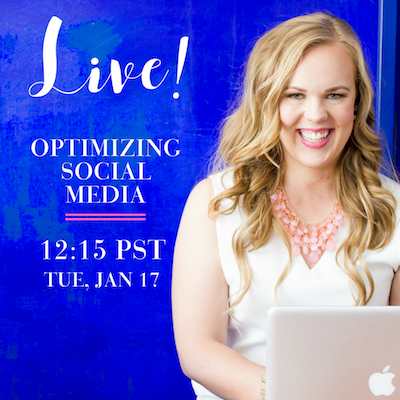 This week I want to go one step further to cover how you can optimize your Facebook and Instagram posts for increased engagement. However, I’m not an expert in this, so I will be interviewing my VA Jenna Graz on this topic! Make sure you head over to my business page to LIKE it and FOLLOW my updates so you can be notified when I go live, and click here to add this broadcast to your calendar. And make sure you open up Wednesday’s email if you want a peek at my exact communication plan! P.S. If you’re ready to talk through YOUR communication plan now with me 1:1, book a free 20 Min Copy Plan call!